Point Reyes is a triangle of land tenuously joined to the rest of California by the famous San Andreas fault. Though part of Marin County, geologically speaking, this stretch of land has little in common with the rest of the county to the east. Point Reyes is part of the Pacific tectonic plate and originated in Mexico millions of years ago. The slow, but relentless work of the San Andreas Fault has ground Point Reyes along the coast of California to its present location. Most visitors to Point Reyes probably get their start at the Bear Valley Visitor Station near one of the main entrances to the park. From here, there are several short trails that an introduction to the area's geological and historic features. The actual earthquake induced gap is under the trees to the right. The light blue poles lined up mark the actual location of the San Andreas fault. Several information kiosks along the Earthquake Trail highlight the active role played by tectonic plate movement in the shape of the California landscape. The most striking example is the reconstructed fence line that shows the 20 foot lateral movement of the Pacific plate with respect to the North American plate in 1906. The earthquake that caused this eery example of Earth's power also leveled much of San Francisco to the south. 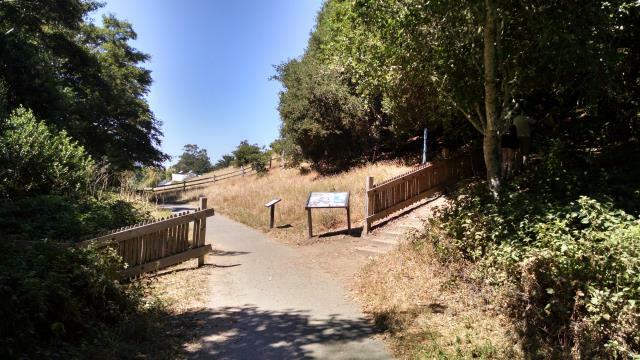 The Kule Loklo Trail provides some insight into the lives of the Coast Miwok indians before the arrival of European settlers. There's a reconstructed village along the route. The structures include Kotcas, conical wooden structures that resemble teepees, as well as more substantial sweat lodges. Cattle ranches started to sprout up here in the 1850's. At one point the dairy farms at Point Reyes were said to provide some of the best milk and cheese available in San Francisco. The cattle traditions of the area are alive and well today. A sizable percentage of Point Reyes remains under active management for cattle. 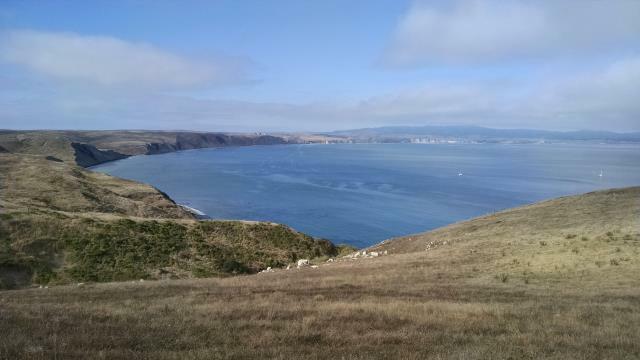 The Tomales Point Trail extends up a narrow peninsula to the northernmost point at Point Reyes. 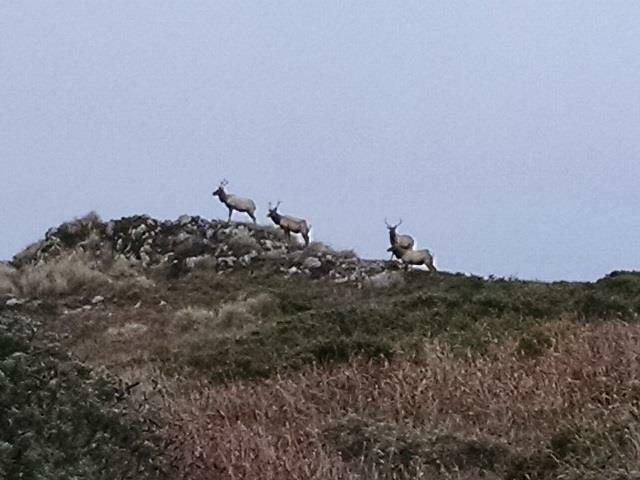 The trail is perhaps best known for having one of the largest concentrations of Tule Elk to be found anywhere. This subspecies of elk, found only in California, were nearly driven to extinction in the 19th century. Conservation efforts have restored them to around 4,000 individuals, many of which can be found here. The Point Reyes Lighthouse and its support buildings. The Tomales Point Trail is not terribly difficult, though it is one of the longer trails to be found in the park. Perhaps the most tiring aspect of the trail is the sandy surface for the last mile or so before reaching Tomales Point. Walking on sand can really tire one out. The Point Reyes Lighthouse is widely known and this fact accounts for the large number of vehicles parked along the road leading to the start of the Point Reyes Lighthouse Trail. Numerous signs warn visitors about the 300+ steps that lead down to the lighthouse itself. Periodic rest platforms along the stairs allow those who need a breather to vacate the narrow stairs to allow others to pass. There are a couple of small trails that shoot out in numerous directions from the lighthouse parking area, or near it. 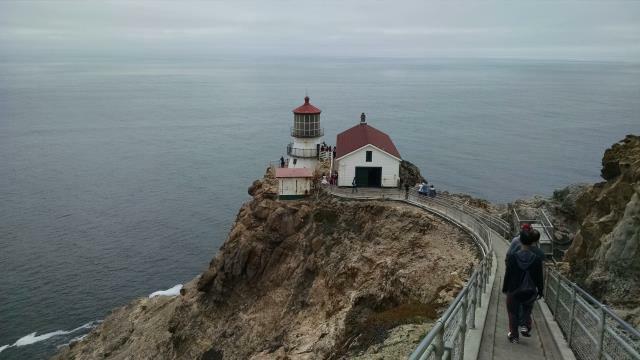 The trail leading just to the north of the lighthouse provides good views of the ocean for whale watching at the right time of year as well as clear views of the expansive Point Reyes Beach that goes on for several miles to the north. Not far from the lighthouse, on the opposite end of the Point Reyes Headlands, lies Chimney Rock. The Chimney Rock Trail does not have a picturesque lighthouse at the end to draw large crowds, so you're less likely to experience tourist gridlock here. To the north of the trail there are views of majestic Drake's Bay. 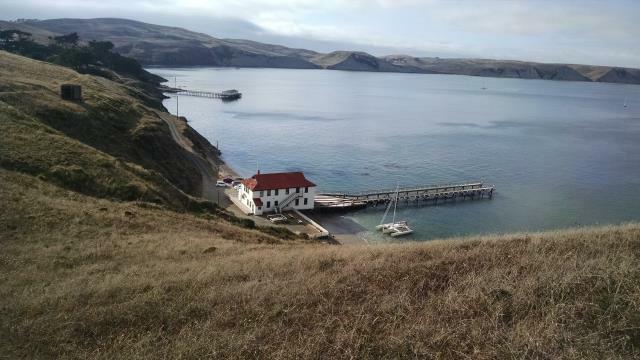 From the Chimney Rock trailhead, there's easy access to some historical structures that housed the Point Reyes lifeboat station. The restored lifeboat launch building once quickly slid 36-foot rescue boats down one of three rails into the water to assist the crews of ships that foundered on the treacherous rocks around Point Reyes. 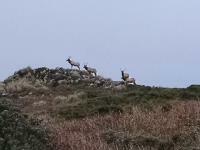 Everyone seems to come to Point Reyes for the lighthouse. At least that's what we thought when we drove to the tip of the peninsula. I think we might have walked as far from our car to the trailhead as we did from the trailhead to the lighthouse! It's easy to see why it's the park's signature spot. The lighthouse perched on the cliffs above the Pacific Ocean is stunning. The 300+ steps (they are labeled) to get down from the cliff highpoint to the lighthouse is a deterent for some, but not many. From the trailhead, the "trail" is actually a paved road, but it's closed off to all but official vehicles. Just to the north of the Lighthouse Trail is a short trail leading to whale watching overlook. Even if whales are not to be found (which they were not on our visit) the spot is ideal for views along Point Reyes Beach as it extends for miles to the north. A couple of very short trails off the road lead to overlooks where one can catch a glimpse of sea lions resting on rocky ledges above the water. Coppertone and I drove a short distance from the crowds at the Lighthouse Trail and hiked to Chimney Rock towards the end of the day. Perhaps it was the lack of a featured site or maybe it was also the apprach of dinner time, but we had much of the trail to ourselves. The path is packed dirt and the terrain generally treeless. Numerous deer were scattered about foraging on the grass. To the left wide vistas of Drake's Bay could be seen. Strangely, the park service marks unauthorized trails with the apt title "Unauthorized Trail". It doesn't really say don't go on them. They're just to let you know. Coppertone and I refrained as we had enough miles to log on the established trails and didn't want to cause any degradation of the terrain. The point on this side of the peninsula is not as picturesque as Lighthouse side, but we were able to enjoy the views without dodging crowds of people. On the way back we passed by the historic Lifeboat station and support buildings. Someone in the lifeboat building, which was closed for the day, was cooking their evening meal. It smelled pretty good. We wrapped up the day with a short jaunt from the trailhead to the Elephant Seal Overlook. It was not the best time of year to look for them and only a few seals were on the beach, but they were there. For a hike specializing in Elephant Seals I highly recommend Ano Nuevo State Park. Penny and I started off our Point Reyes trip with a couple of easy hikes around the main visitor station of the park. Kule Loklo features a recreated Coast Miwok village as it might have looked 200 years ago. The shelters are interesting, but we were disappointed that the largest structure in the village was locked up. The gaps in the door provided evidence that the temperature inside was a good deal cooler than that outside. Doubling back from the village may be the easy way out. We made a loop out of it by jumping on the Horse Trail and then Morgan Trails. Neither transition to these trails was very clear, making it a tough sell for the casual visitor. As you might expect, the Horse Trail is shared with equestrian riders, as is the Morgan Trail. So expect to encounter horses there and yield as the pass. This trail is not ADA compliant, but it's fairly short and flat so it's easy enough for almost all abilities. Point Reyes lies at the boundary between the North American and Pacific plates, so of course we had to hike the interpretive trail that details the area's geologic history. The trail itself is ADA compliant, paved and mostly flat. It's suitable for all ages. Actually, even the interpretive signs are tailored for all ages. Every display comes in an adult and kid version, each customized for different levels of understanding. The highlight of the trail is the earthquake fence. The 1906 earthquake that leveled large parts of San Francisco left a startling bit of evidence here as well. A fence line that had been a continuous straight line was cut in two with both halves separating by 16 feet. Portions of the fence was left to illustrate the radical changes in terrain that can occur when earthquakes occur.